You just received your child’s PSAT score report. This is the perfect time to put it into use to start your child on the path to a top SAT score. The PSAT score report provides valuable information on how your child can expect to score on the SAT as well as the means to start preparing right now. So if your daughter got a 60 in Critical Reading, a 52 in Math, and a 65 in Writing on the PSAT, you can expect that she would score approximately 600 in Critical Reading, 520 in Math and 650 in Writing. So she would achieve an overall SAT score somewhere in the neighborhood of 1770 if she took the SAT without any further preparation. Please be aware that the PSAT and SAT are very similar but that there are significant differences, so this is only an approximation but it is a good way to get an idea of what your child would probably score if she took the test today. In my next post I will show you how to start using this information to get your child the SAT score she needs to get into her top colleges. I tell my students to look at the percentage score – that can be a more reliable indicator. I’ve found that PSAT scores tend to run a little lower than SAT scores – ie. A 60 PSAT score in Critical Reading would be about the 88 percentile which then corresponds to about a 720 SAT score. Thanks for mentioning this Stacey! I have heard this line of reasoning before, but I advise my students to avoid converting their scores in this way. The reason that the scores for the PSAT tend to run lower than the SAT for a specific percentile is that far fewer students study for the PSAT than for the SAT. So the boost in the 88 percentile score you are computing is accounted for by studying and so isn’t their actual starting point. I prefer to be conservative when attempting to extrapolate PSAT to SAT. 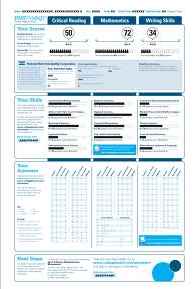 The PSAT score report can be a wonderful tool when revisited by the second or third session, after the student has learned new techniques for taking the SAT. We do the PSAT incorrects using the new methods. It is almost always a “eureka” moment. Hi Bob! I love it when I have the time to incorporate the PSAT into an early session of a student’s program. I’m glad to hear that you do this too!